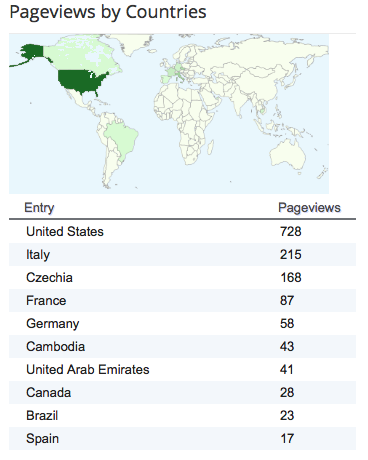 This report from Blogger shows me where in the world readers of the blog are reading it. Over the years, there's been a relatively solid readership from Russia. But as you can see from this report, captured a few moments, readers from there haven't even dented the top ten today. Italy has been well-represented here lately. Why? I have no idea. Czechia (the Czech Republic) has also been well-represented in the past day or so. Besides the United States, where I live, I've only been to three of the other countries in the top ten: Germany, Canada, and France. (My visits to the latter two were brief. I stopped for a short time on the Canadian side of Niagara Falls and I've had a couple of layovers at Orly in Paris, neither visit affording a very good sample of the countries in question.) They're places I hope to revisit one day. There are lots of places I hope to visit. 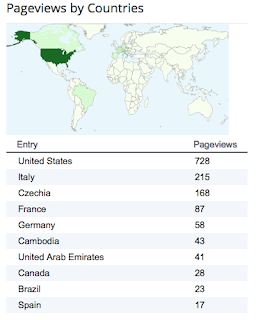 Anyway, thanks to all visit and read the blog.